The Power-Pipe® Drain Water Heat Recovery System is an effective way to reduce water heating costs by 20 to 40% and continue saving throughout the entire building lifecycle. Power-Pipe® Drain Water Heat Recovery systems can substantially reduce water heating costs and help businesses and institutions obtain energy certifications such as LEED. Power-Pipe® Drain Water Heat Recovery systems have many applications for commercial and Industrial operations. Contact us for a feasibility study on your applications. Water falling down a vertical drain stack does not run down the middle of the stack, but instead clings to the inside wall of the pipe. In a Drain Water Heat Recovery (DWHR) application, falling drain water forms a thin film that rapidly imparts its heat to the colder pipe wall. 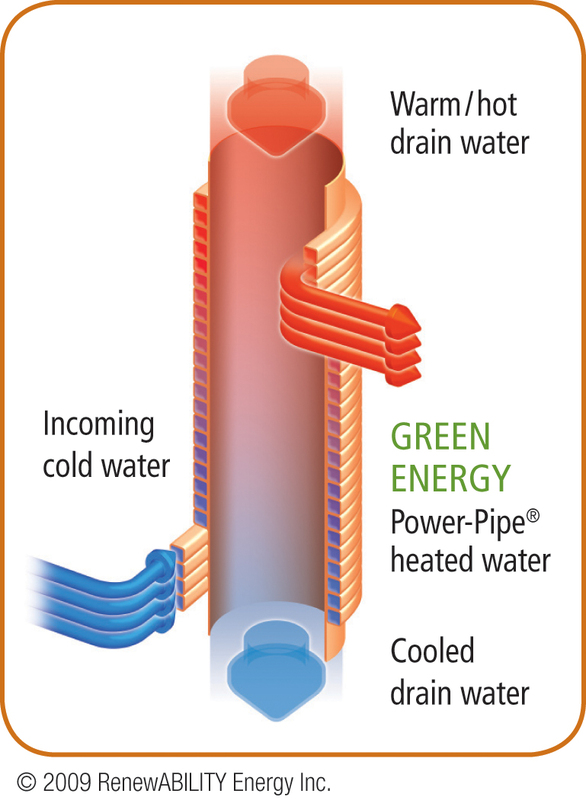 The Power-Pipe® captures much of this heat, then "recycles" it to raise the temperature of incoming cold water. All Power-Pipe DWHR units are performance tested according to the CSA B55.1 testing protocol and safety tested through UL and the CSA B55.2 standard. The Power-Pipe is simple to install in new and existing homes. 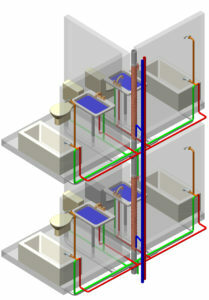 To maximize the efficiency, all the fresh water in the home is plumbed through the unit. Some applications may require an alternate set up where the Power-Pipe supplies pre-heated water to only the water heater or the cold side of the shower. Click below to view full installation instructions. The Power-Pipe consists of multiple coils of copper tube wrapped together around a copper central drain pipe. Hot water going down the drain transfers its heat to incoming cold water moving up the coils. This exclusive, patent-pending design provides more efficient heat exchange than other DWHR devices, and this with no discernible water pressure loss. In addition, the Power-Pipe's self-cleaning design assures a maintenance-free operation. The Power-Pipe is manufactured using quality materials. Copper DWV used for the inner drain pipe is compliant with the ASTM B306 standard. The Type L or Type K Copper used for the outer coils is compliant with the ASTM B88 standard. All parts are silver soldered or brazed. RenewABILITY offers free training courses, both in person and via webinar. If you are an engineer, architect, or building professional, sign up for our continuing education course today to learn more about the applications and installation of our product. 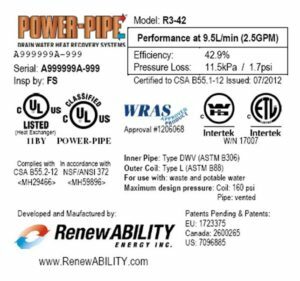 The Power-Pipe is independently verified to be in conformance with the CSA B55.2 safety standard. This label is affixed to every unit that is manufactured. CSA B55.2 requires that DWHR units be lead free and safe for potable water. Third-party testing performed by the University of Waterloo has verified the reported performance data, and this report is available for download. Every unit is pressure tested to 160 PSI before leaving the manufacturing facility, which ensures leak-free performance. In residential or multi-residential applications, when warm water goes down your drain from showering, a faucet, or washing appliances, it carries away valuable energy with it. The same applies for commercial or industrial applications, for any heated water processes which carry away valuable energy as they run down a drain. Drain Water Heat Recovery is the process of recovering part of this valuable energy from the warm water, and using it to preheat your incoming cold fresh water. 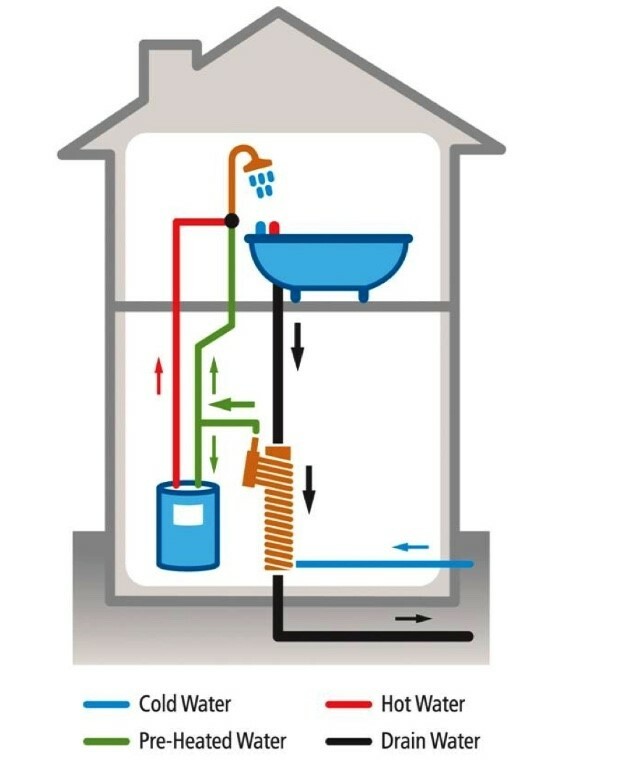 This process can be used for your home, apartment, condo, business or many industrial processes using heated water. With an innovative and proven DWHR system such as the Power-Pipe, there are no moving parts. DWHR is already in use around the world, providing affordable, long-lasting savings. Water flows rapidly down a vertical drain pipe. It is a common misconception that there is not enough time for the heat transfer to occur between the warm liquid and the wall of the inner pipe. The fact is that heat transfer is not highly dependent upon resident time but is far more dependent upon intimate contact between the fluid and the wall. Drain water flowing quickly becomes a very thin turbulent film of about a millimeter in thickness. As a result, it imparts its heat to the pipe wall very readily. 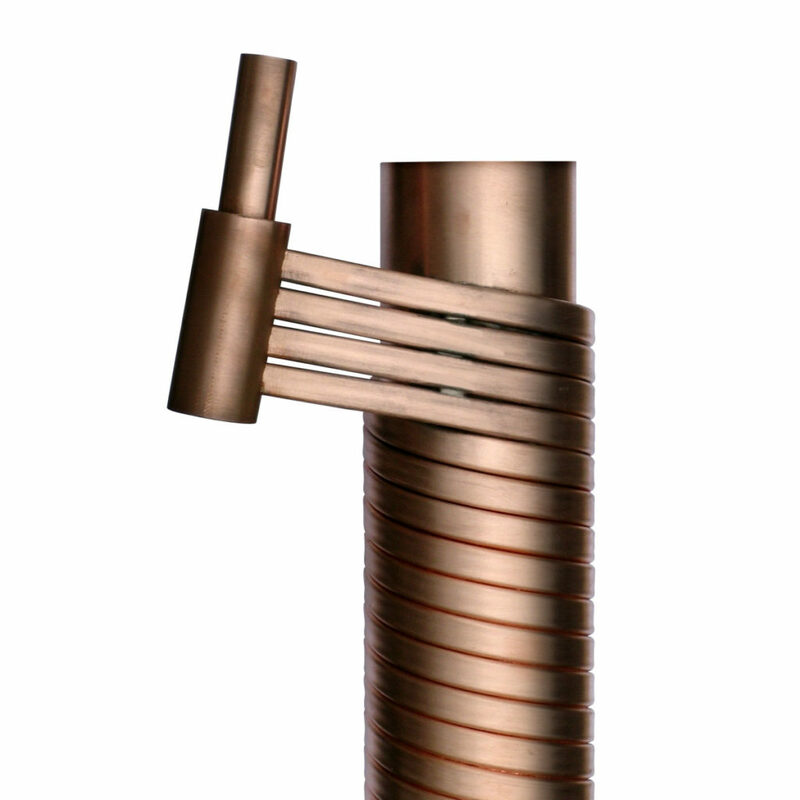 In the case of the patented Power-Pipe® DWHR, a series of formed copper coils are tightly wrapped around a specific length of copper drain pipe at our manufacturing facility. This process forms what is commonly known as a double wall heat exchanger. The double copper wall design protects incoming fresh water carried in the coils from being contaminated by the drain water. Visit our partners to purchase the Power-Pipe today! Interested in becoming our partner? Contact us for current distribution opportunities! We offer free shipping to the USA and Canada when you purchase online!